DIMECC Innovation Camp is an innovation contest gathering engineering and business students to search novel and innovative solutions for company challenges. ution to challenges set by companies. DIMECC Innovation Camp will involve 150 students from three universities and several coaches from companies and universities. In addition the event includes inspiring keynote presentations on the annual theme. The event will culminate in the evening of the third day when the teams present their results and the judges reward the best teams. If you want to participate please take contact to Essi Huttu, DIMECC Ltd.
2nd Innovation Camp poster&program here. The recent technological advantages and changes in the operating environment of companies, such as digital technologies, fragmented demand of customers, material and process innovations, arise of service business and smart anything initiatives, bring new opportunities to business leaders. To stay competitive companies need to change the game, not just play the game. The trick is to make a change that is in tune with the changing attitudes and aspirations of customers, with the capabilities of technology. If it can be done, it will be done. 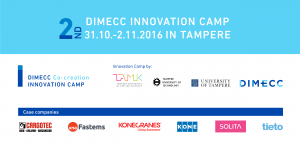 In TAMK Innovation Camp is part of the following courses: CAE 5K00BH62-3004, Projektin määrittely 5S00BU71-3002, Mechatronics 5K00BG84-3003. For students taking part in these courses the registration comes under the TAMK’s own registration and separate registration is not required. If you are not taking part in these courses and would like to participate in DIMECC Innovation Camp as a TAMK student please contact Senior Lecturer Jere Siivonen (jere.siivonen(at)tamk.fi, 040 637 8468).